Cardinal Seán Patrick Cardinal O’Malley, OFM Cap. is the ninth bishop and sixth archbishop in the more than 200 year history of the Archdiocese of Boston. He was born in Lakewood, Ohio, June 29, 1944, son of the late Theodore and Mary Louise (Reidy) O’Malley. He attended St. Gabriel and Sacred Heart Elementary Schools in Pennsylvania and St. Fidelis High School, a high school seminary conducted by the Capuchin fathers, in Butler, Pa. He prepared for the priesthood at St. Fidelis Seminary, also in Butler, and at the Capuchin College in Washington, D.C. He was professed on July 14, 1965 in the Capuchin Order, a religious order dedicated to following in the tradition of St. Francis of Assisi. On Aug. 29, 1970, Pittsburgh’s Auxiliary Bishop John B. McDowell ordained him a priest of the Order of Friars Minor Capuchin. He then went on to earn a master’s degree in religious education and a doctorate in Spanish and Portuguese Literature, both at the Catholic University of America in Washington, D.C., where he also taught from 1969 to 1973. In 1973 he began serving as Executive Director of El Centro Catolico Hispano in the Washington Archdiocese before being named Episcopal Vicar for the Hispanic, Portuguese and Haitian communities and executive director of the archdiocesan Office of Social Ministry in 1978. It was during these early days of his priesthood that Cardinal O’Malley developed a strong commitment to the issues of social justice and care for new immigrants. Pope John Paul II appointed him as coadjutor bishop of the Diocese of St. Thomas in the Virgin Islands on May 30, 1984. The Most Rev. Edward J. Harper, CSSR, the bishop of St. Thomas assisted by Washington’s Archbishop James A. Hickey and one of the capital city’s auxiliary bishops, Bishop Eugene Marino, SSJ, ordained him a bishop on Aug. 2, 1984 at the Cathedral of Sts. Peter and Paul in St. Thomas, V.I. He became the diocesan bishop of the Caribbean diocese, succeeding Bishop Harper, on Oct. 16, 1985. On June 16, 1992 Pope John Paul II announced the appointment of Bishop O’Malley as the sixth bishop of Fall River. At the time, the Fall River Diocese was reeling in the aftermath of the case of Father James Porter, one of the first high-profile clergy abuse cases in the country. Cardinal O’Malley was installed at the Cathedral of St. Mary of the Assumption on Aug. 11, 1992, the Feast of St. Clare, a Franciscan feast day. As Bishop of Fall River, he was widely credited with bringing healing to the diocese following the Porter scandal, settling over 100 clergy abuse cases, meeting with victims and instituting a “zero-tolerance policy” for clergy accused of abuse of minors. During his 10 years in Fall River, he was involved with the wider community both within the diocese itself and in the Commonwealth. He was active in the work of the Massachusetts Catholic Conference, especially on pro-life issues. While Bishop of Fall River, he was appointed by Pope John Paul II to the Special Assembly for Oceania of the Synod of Bishops, which was held at the Vatican in the fall of 1998. He has also served as Apostolic Visitator for several seminaries in Central America and the Caribbean. On Sept. 3, 2002, Pope John Paul II named him to be the fourth Bishop of the Diocese of Palm Beach, Florida, which had seen its previous bishop resign six months earlier after admitting to abuse of minors. He was installed at the Cathedral of St. Ignatius Loyola in Palm Beach Gardens on Oct. 19, 2002. After less than a year in Palm Beach, on July 1, 2003, Pope John Paul II appointed him the Archbishop of Boston, which at the time was experiencing its own clergy abuse scandal that had resulted in the resignation of Cardinal Bernard Law. Cardinal O’Malley was installed archbishop on July 30, 2003 at the Cathedral of the Holy Cross. He immediately set about meeting with victims of clergy sexual abuse, settling new and pending cases, and implementing mandatory child safety training programs. He gained world-wide attention for his decision in April 2004 to sell millions of dollars’ worth of archdiocesan property, including the archbishop’s mansion, to settle clergy abuse claims. Pope Benedict XVI elevated him to cardinal at the consistory held March 24, 2006 and gave him the titular church of Santa Maria della Vittoria. The Holy Father also named him a member of the Congregation for the Clergy and the Congregation for the Institutes of Consecrated Life and Societies of Apostolic Life. During a trip to Rome to take formal possession of his titular church in September 2006, Cardinal O’Malley became the first cardinal in the world to launch a personal blog, cardinalseansblog.org, which he continues to update weekly. In the late 2000’s, with the immediate effects of the clergy abuse crisis in Boston largely passed, Cardinal O’Malley turned his attention to the long-term spiritual and fiscal health of the archdiocese. He implemented plans to conserve parish resources, launched the Campaign for Catholic Schools aimed at strengthening and expanding the existing schools, and stabilized the archdiocese’s lay-employee and clergy pension systems as well as the clergy health and retirement funds. He has also put a great emphasis on vocations and outreach of the Church to youth, including expanding the archdiocese’s use of the Internet and social media and encouraging participation in pilgrimages to the International World Youth Days and the annual March for Life in Washington, D.C.
After the unexpected resignation of Pope Benedict in 2013, Cardinal O’Malley found himself the subject of international media attention when Vatican observers began to speculate that he could be chosen by his fellow cardinals as the next pope. Shortly after Pope Francis’s March 2013 election, the Holy Father selected Cardinal O’Malley to be the only North American member of his Council of Cardinal Advisors — commonly called the “Group of 9” or simply the “G9” — who advise the Holy Father on the restructuring of the Roman Curia. The council began its meetings in October 2013 and continues meet regularly with the Holy Father every two months. Pope Francis has also asked him to lead the Vatican’s Pontifical Commission for the Protection of Minors, which held its first meeting in May 2014. 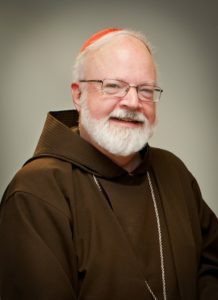 Cardinal O’Malley is an active member of the United States Catholic Conference of Catholic Bishops and he currently serves as outgoing chairman of their Committee Pro-Life Activities. Previously, he headed the Commission on Clergy, Consecrated Life and Vocations. He is also a member of the USCCB Administrative Board, a member of the committees on Migration and Pro-Life Activities and the subcommittees on the Church in Africa and the Church in Latin America. Throughout his years as bishop, Cardinal O’Malley has served on numerous other commissions and committees, including Missions (of which he was chairman), Priestly Formation, Hispanic Affairs, Migration, as well as serving on the board of directors for Catholic Relief Services, the Association for the Development of the Catholic University of Portugal and on the board of trustees of his alma mater, The Catholic University of America in Washington, D.C.